Today, new reports confirming the Clarín story — without any additional detail — are appearing at Corrispondenza Romana & Rorate Caeli. OnePeterFive has confirmed with our own sources close to the CDF that the reports are true: Cardinal Müller will be leaving his position as Prefect of the CDF on Sunday, July 2nd. It is true that Müller has chosen to view the post-synodal apostolic exhortation through rose-colored glasses. In January, in an interview with Italian television station TGCOM24, the German cardinal said that “Amoris Laetitia is very clear in its doctrine and [in it] we can interpret [sic] the whole doctrine of Jesus concerning marriage, the whole doctrine of the Church of 2000 years history.” This may not have been well-received by those who see Communion for the divorced and remarried, regardless of repentance, as a new and different path for the Church. In my January 11, 2017 commentary (linked above) I outlined the “climate of fear” at the Vatican, and the fear that many who work at the Vatican are being monitored, KGB-style. In a related report, I mentioned how “Vatican-issued cell phones and email addresses are treated with absolute suspicion, and reports of employees being quietly dismissed from congregations like the CDF for the crime of agreeing with the resistance to Amoris Laetitia have surfaced.” I have personally spoken with individuals who have experienced accidental playback of recorded phone calls when speaking with Vatican sources, or who have been told by sources that they should not discuss things over the phone. I also outlined in some detail the stories of abuse received by Catholic journalists, and the claims made by Vatican correspondent Edward Pentin concerning “political manipulation, deceit, and calumny happening within Vatican walls.” In May, a communique was made public from the Dean of the College of Cardinals to the cardinals living in Rome which called upon a “noble tradition” that prescribed that all cardinals living in the eternal city must “inform the Holy Father, by way of the Secretariat of State, the period of their absence from Rome and the address of their stay.” And even more recently, I’ve heard reports (as yet unsourced) of more draconian, police-state procedures being carried out — unannounced office raids and long interview/interrogation sessions of staff members. With the stakes thus clarified, certain conclusions are inescapable. 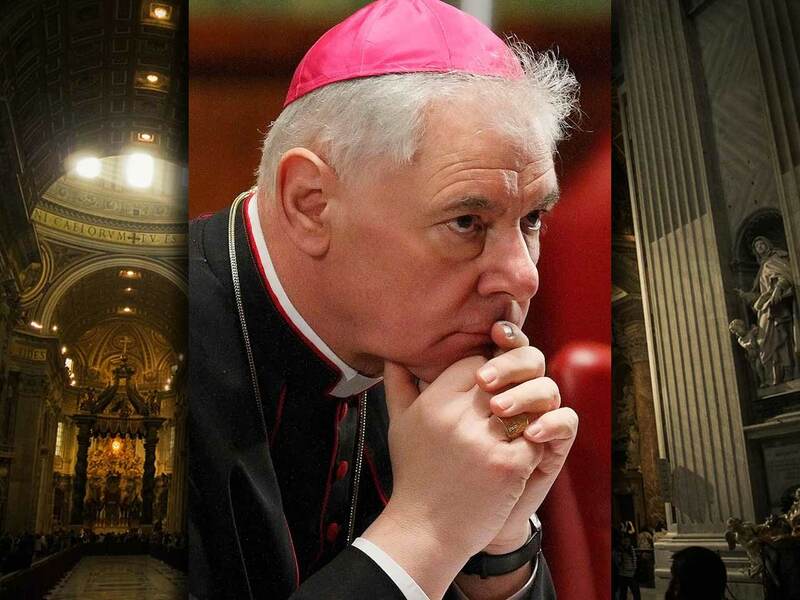 If Cardinal Müller thinks he can stand athwart the darkness by staying where he is, trying to tamp down the fires of discontent stirred up by the dubia from within the Vatican apparatus by means of a more subtle, diplomatic approach, he is seriously mistaken. And if he is being told what to say, and willing to do so (recall similar reports that Msgr. Pinto from the Roman Rota was given a papal order to attack the Four Cardinals) then it is impossible for him to be trusted — and it suggests that he has come to identify, somehow, with those who have essentially held him captive in his increasingly ineffectual position. But sitting on the fence doesn’t make a man an ally of either side. Mediocrity is never enough to save us. Müller resisted Francis just enough to make himself a problem, but resisted making a stand just enough to lose the trust of those who wanted to see in him a beacon of hope as the Church’s chief defender of doctrine. By trying to be useful to both sides of this dispute, he became useless to both. And now he’s gone, and he never used the weight and authority of his position to say what he should have said — to stand with the Four Cardinals, and all the countless unnamed Catholics besides, and choose Christ, whatever the cost. Sources close to Cardinal Müller have indicated that his removal from his position — where he clearly felt a duty to try to work harmoniously with the pope — may in fact lead him to feel more free in his own assessment of the current crisis. I hope this is the case. And I hope it’s not too late to matter.